Set in and around Arkansas, Angela Mitchell’s debut collection, Unnatural Habitats, bravely explores all four corners of the human heart, and then some. Here we have characters who are sloppy and funny and flawed. You may find yourself, despite best intentions, falling in love with the whole lot of them, for Mitchell writes with all the grace of Elizabeth Spencer and all the grit of Larry Brown. The stories in Unnatural Habitats remind us that mistakes never look like mistakes, in the moments we make them. These characters do whatever they think they need to win or simply survive, only sometimes stepping back to see how decision echo down through years and even generations. Angela Mitchell pulls off the wizardry of inviting the reader to look deeply inside people who would often prefer not to look closely at themselves, afraid of what they might see. These characters and stories will stick with me. Angela Mitchell writes some of the best opening lines I’ve seen in a long time. So don’t start any of the stories in Unnatural Habitats if you’re in a hurry, because once you’ve read that first sentence, you will be hooked and unable to do anything else until you get to the end. This is an exciting debut by a young writer with loads of talent and plenty of heart. Highly recommended. Unnatural Habitats is full of raw, real, rural characters with complicated Midwestern minds. These are fiercely independent people trying to make their slow way in a fast world that sometimes breaks their hearts. Mitchell’s voice is fresh and brave. She writes the Missouri landscape with affection and truth. We are the animals Mitchell pens and we’re better for her vision. Melissa Scholes Young, author of Flood. The loosely connected stories in Angela Mitchell’s debut collection are as fierce and intrepid as their unruly inhabitants. Cautioned not to tap the glass or else rile up the snakes, as is the protagonist of the opening story, they ache to shatter the glass with a sledgehammer. Sometimes that’s just what they do. 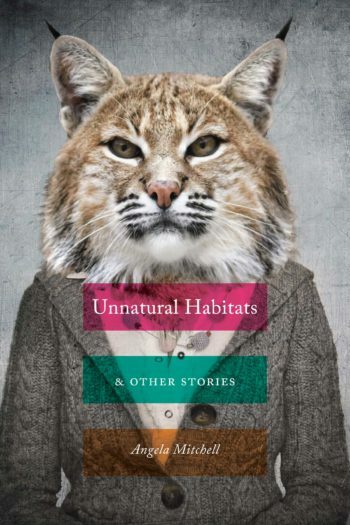 Barbed and tender, wise and funny, the stories in Unnatural Habitats lodge into you. All worthwhile short stories must find a way, against the odds, to entertain. These stories do. They’re knowing. They’re funny. They hold a sense of lurking danger. Angela Mitchell writes about her schemers, her outscasts, her trouble-plagued men and women, with such a natural authority that their messy behavior makes perfect sense. Captivating, perceptive, Unnatural Habitats is an impressive first book. Unnatural Habitats & Other Stories is a beautifully designed book populated by dynamic people enmeshed in richly-textured environments. I love the leading role these places play—places with big personalities that assert their will and pressure these complex characters to misbehave, even as they yearn for—and move toward—intimacy and forgiveness. Angela Mitchell does not avert her gaze from the quiet horrors that bloom in every crack. These stories are honest, poignant, expertly crafted, wise, and full of abundant light. I look forward to visiting them over and over again. Matt Cashion, author of Last Words of the Holy Ghost and Our Thirteenth Divorce.